The following is from the July 2018 edition of The Pastor’s Authority and the Church Member’s Responsibility, available as a free eBook for viewing and downloading from www.wayoflife.org. In giving miscellaneous suggestion to church members, we would say, first, that they should that respect and love the pastors. “And we beseech you, brethren, to know them which labour among you, and are over you in the Lord, and admonish you; And to esteem them very highly in love for their work's sake. And be at peace among yourselves” (1 Th. 5:12-13). This is the church member’s responsibility to pastors in a nutshell. In this context, Paul mentions a pastor’s work, because it is for “their works’ sake” that the church members are to esteem them. They labor. They are hard-working men, not lazy men. Hard work is required to build and maintain biblical churches. There is the work of Bible study, praying, teaching, preaching, evangelism, discipling, and disciplining. They are overseers. They have the calling and gifting to oversee the flock. This refers to pastoral authority. It refers to edifying or building up the members, guiding and providing vision and direction, and protecting from every danger. Note that the pastors are over the church “in the Lord.” They have authority only if they are leading in submission to God’s authority and according to God’s will. They are admonishers. This encompasses teaching, exhorting, and warning, but the emphasis of the word “admonish” is on warning. The underlying Greek word, “noutheteo,” is translated “warn” in Acts 20:31; 1 Co. 4:14; Col. 1:28; 1 Th. 5:14. A man who cannot or does not exercise a ministry of admonition, reproof, rebuke, and warning is not qualified to be a pastor, and the fruit of such a man is a soft, lukewarm, backsliding congregation. Many pastors who want the high respect described in this passage do not fit the calling that is described in the same passage. The people are to esteem them very highly in love “for their work’s sake,” meaning because of their work, because they do the work described here. The Bible nowhere teaches blind obedience and “unquestioning loyalty” toward spiritual leaders. That is cultic. It is popery. For its part, the congregation is to know their leaders. This means more than simply to know who the leaders are. That should be obvious. It means to know them in the sense of knowing that their calling and authority is from God and knowing the value of such leaders. The people need to be taught about the qualification and work of pastors so they can exercise the right kind of respect toward them. The congregation is to esteem the leaders very highly in love. Note the words “very highly.” The word “perissos,” which is translated “highly,” is a powerful term in itself. It is elsewhere translated “beyond measure” (Mr. 6:51), “abundantly” (Joh. 10:10; Eph. 3:20), “superfluous” (2 Co. 9:1), and exceedingly” (1 Th. 3:10). But in 1 Thessalonians 5:13, “perissos” is combined with “hooper,” a common preposition meaning “very.” This is strong language. Biblical pastors should be shown great esteem. Elsewhere Paul uses the term “double honour” (1 Ti. 5:17). That is God’s express will in the matter, and it is on this basis that churches will be judged at Christ’s judgment seat. I wouldn’t want to stand there and give account for not having a proper and godly relationship with my pastors. Note that Christian love is the key to showing proper honor to one’s spiritual leaders. It is the key to a wife’s honor toward a husband and a child’s honor to a parent and a church member’s honor to a pastor. This means that for a church to treat its pastors as it should, the members must be saved and walking in fellowship with Christ, because this is the only way to have true love. This reminds us of the importance of limiting church membership to those who are qualified according to Acts 2:41-42. The pastor who is not careful in this matter and hasty in receiving members should not be surprised if the people do not obey God’s Word and if they cause him great heartache. As with Christian love in general, the loving esteem of church members toward pastors is something to be shown in concrete actions. Godly love is not something merely to be “felt”; it is something to be done. As with a husband toward a wife, the church member should think of how he can show loving esteem to his pastor. Some of the ways are as follows: being faithful and dependable, being punctual, showing godly attentiveness to the preaching and teaching, obeying the teaching, communicating true words of encouragement (not flattery and guile), always giving him the benefit of the doubt, and supporting him financially. As a husband’s heart should safely trust in his wife (Pr. 31:11), so a pastor’s heart should safely trust in his congregation. All too often, a pastor has to live in fear that he is being attacked behind his back and that efforts are underway to divide the church and to steal the people’s affection. While a sinning pastor should be disciplined by the church (1 Ti. 5:19-21), pastors who are faithful to God’s Word should be given unceasing esteem in love. Note that a biblical relationship between the pastor and the people results in peace. It is a major part of maintaining peace in the church. 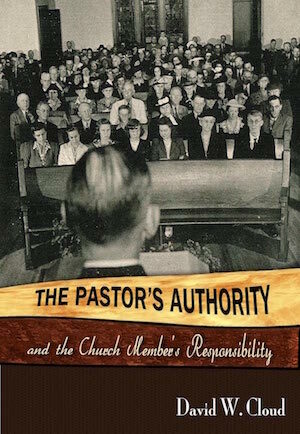 For more on this see The Pastor’s Authority and the Church Member’s Responsibility, available as a free eBook for viewing and downloading from www.wayoflife.org.